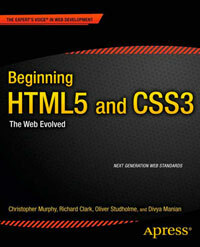 A website promoting a German HTML5 book by web designer and developer Peter Kröner. The site is very well coded, for example the content of the asides on each page relates to the page content rather than the site as a whole, so they are therefore nested in the content sections. Peter could maybe have used nested sections in the asides to drop their content down a level in the outline so it isn’t at the same level as the main content. There is also a demo section that includes video, canvas (with animation), drag and drop between two browser windows, and new form input types.